WHY MOOSE ARE DOMESTIC ANIMALS? Only several ungulates species are domesticated by man during thousands of years. The existing domestic animals satisfy all man's needs. Perhaps there is no need to try to domesticate others? Nevertheless, time after time, attempts to «overcome the nature» and breed a new domestic animal are undertaken. Orphaned moose calves are hand-reared, tamed and used not only as horses but also as pets. I think this is the best way to use moose and other deer! It is known that in Yakutia moose breeding was replaced by reindeer breeding in XV-XVII centuries (1). Swedish army had moose troops, but only until real battles. Moose turned out to be wiser then their knights, they left battlefield to hide in the nearest forest if a real danger occurred. After several hundreds of years this experience was unlearnt. When the USSR decided to become worldwide, i.e. 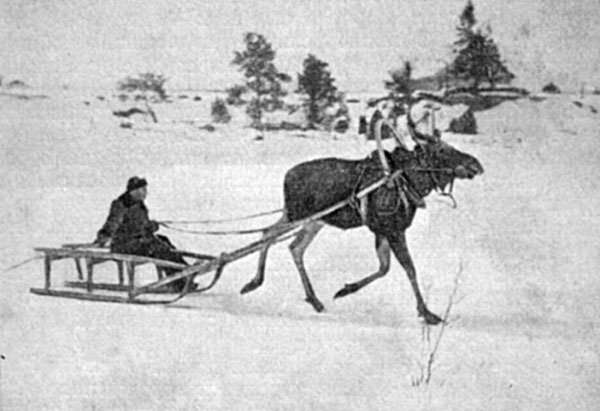 in the 1930s, war-moose were expected to solve the problem of deep snow cross-country cavalry passability. Moose were trained to carry armed riders and not to be gun-shy in secret moose husbandries. The work hardly could be done before Soviet-Finnish war (1939), and, only several years later, the Second World War revealed that the cavalry became only pix. As making a military moose failed, the Russian Conquerors of the Nature decided to turn moose into a cross-country animal transport for geologists and lumber loggers. At the same time, moose was regarded as potential meat and milk domestic animal who will eat lop on wide wood-cutting areas of the USSR. Russia takes the first place in timber stock in the world and one of the first places in wood production. The wood-felling byproduct, branches, are usually committed to the flames because of high transportation costs in Russia. Thousands tons of pine branches and aspen bark seemed to be easily converted into meat and completely solve a so-called food problem persisted in the USSR. New moose husbandries were to be called farms. Soon after the Second World War, in 1949, the first experimental Pechora moose farm was established. By that time, the Pechoro-Ilych Reserve had 14 tame moose up to 3 years old. So, according to official data, the Pechora farm really started in 1946. According to another paper, Pechora tame moose produced their first offspring in 1943, but, perhaps, this is classified information. 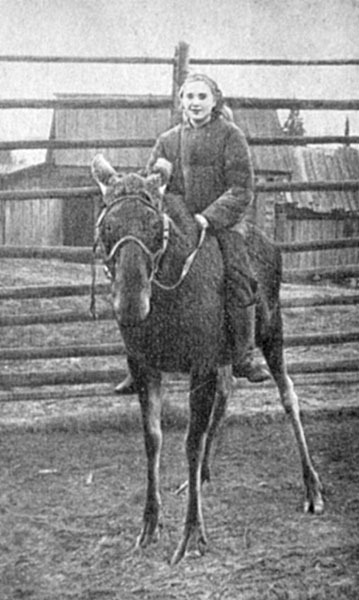 The Pechora farm had a task to produce meat, milk and draught breeds of moose and develop methods of keeping them. The result of this work is reported in a book written by first director of the farm Eugene Knorre (1). The book is available in the library on this site, but only in Russian. 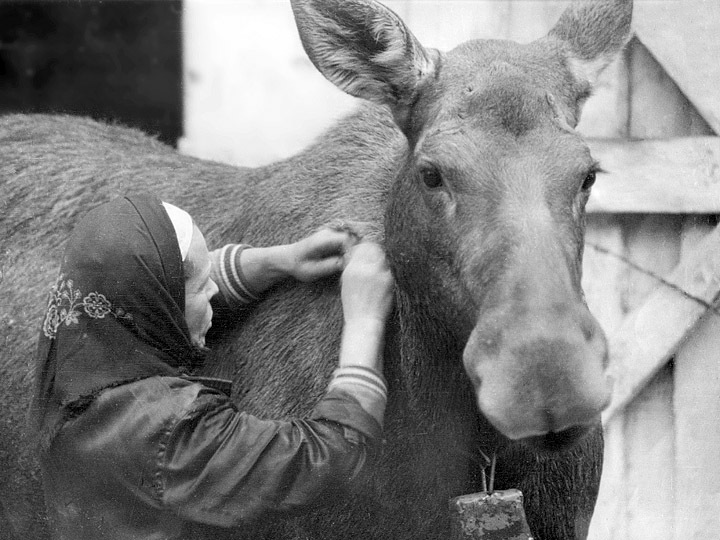 The results were not too impressing, from the point of view of 1960-s, and only now it became obvious that the enthusiasts from deep taiga made the basis of «moose farming»: they started moose milking and developed the method of semi-free moose keeping. Labor inputs made «meat-and-skin produce» unprofitable because every moose calf should be bottle-raised. Counting the meat cost, Knorre omitted expenses of milk and bottle-raising labor cost. 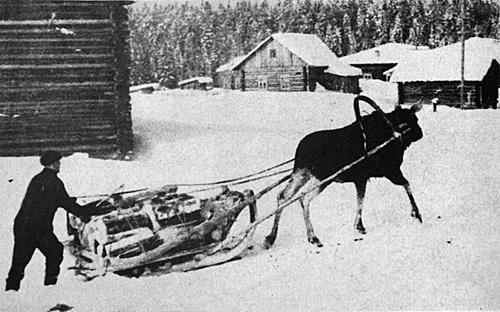 Draught force was too low: look how a coachman helps a moose to pull the slightly laden sledge on a steep slope; a whip is useless. On the other hand, the children drive will be excellent! Photo by M. V. Kozhukhov from the book: Heptner W.G., Nassimowitsch A.A., «Der Elch», A. Ziemsen Verlag, Wittenberg Lutherstadt, 1967 . In the USSR, moose domestication was a part of the tremendous work «The Conquest of the Nature, The Conquest of Taiga» (maybe because the conquest of the whole world failed). All on the Earth should belong to Soviet people, be grown, controlled, used and eaten, generally. Interests of four-footed beasts were not taken into account, and even now the majority of human deny the existence of such interests. Castration, whip, «chawks», cannon-bit, etc. – all is fair in the War against the Nature. No retire: at the age of ten every moose should be killed for meat. And in the same book we read moose characterization as extremely harmless, meek animals, and a great material about their ecological plasticity and about use of their biological peculiarities for taming. From the point of view of modern science, some statements may seem naive, but, in practice, they successfully tamed, milked, rode moose, explored the milk composition, and later completed a great number of physiological experiments. How apprehensive were their first attempts to milk a moose, but soon they found out that milking moose is no more dangerous than milking a cow. A semi-free way of keeping tame moose proved to be cost-effective and conducing to animal health. 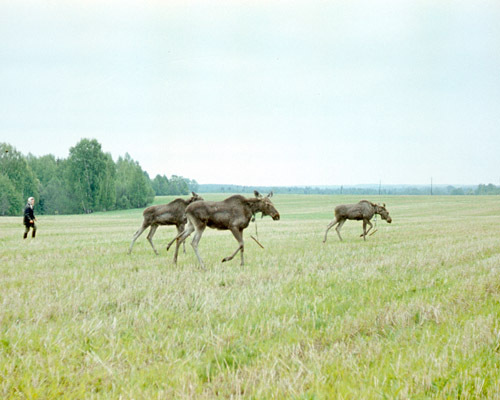 In 1963 the Kostroma agriculture experimental station established another moose farm for as many as 800 animals, on the basis of knowledge achieved on Pechora farm. It started with 2 calves, but next year Nikita Hruschov gave a command to bring the two tame moose to Yugoslavia, as a gift to Joseph Tito. The first director of the farm Anatoly Mikhailov tried to hide yearling calves in a deep forest, but they were captured with a military helicopter. During the following 6 years the farm «gathered» wild newborns in the region and even paid for each. The Pechora farm gave 5 adult animals. Since 1970 there was no more need to «gather» calves in forests because domestic moose cows produced first offspring, mainly thanks to a hard work of Appolinariya (known as Polina) Vitakova. This is her photo, with her favorite milch-moose Lucy. A senior scientific researcher Appolinariya Vitakova worked on the farm till 2001, longer than any other employee. For long years she and Anatoly Mikhailov carried the farm on their backs doing not only scientific work. Lucy is a two-records-holder; she lived as long as 20 years and 4 months and gave up to 6 liters of milk per day. The Kostroma farm still accepts orphaned calves acting as moose refuge, but calls not to take calves from the nature unless mother's death is confirmed. In spring and summer, mother moose usually leaves her calves on a meadow during browsing and returns only to feed them with milk. Since the day of its establishment the farm subordinated to different agricultural and forestry scientific institutions. Now it is independent and called the Sumarokovo Moose Farm, State Budget Scientific Research Institution of the Kostroma Region, but I'll continue to use the old name. Though in 1970-s live stock didn't exceed 20, the researchers began to think in advance about foraging problems. Agriculture landscapes in a densely populated region differ from Pechora taiga. Moose obstinately grazed agriculture fields. The damage is not noticeable while moose number is 20, but what would happen if livestock grew up to 800? 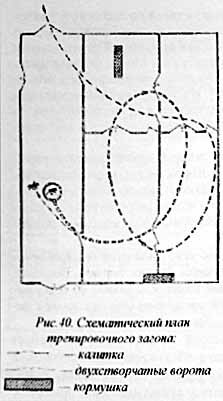 Farm designers didn't take into account an evident circumstance. Wood felling is seasonal, but moose must eat round the year. Moose won't leave a wood-cut during winter because of food abundance there, but nothing holds them during the other seasons. The idea of controlled grazing instead of free ranging took the brains of agricultural scientists. They think: If moose go every which way, we'll restrict their movements. Wooden stocks on legs, fetters, shackles, and other engines of violence were tested. «A controlled grazing» failed again and again. Young animals stayed near each other without any «restrictors»; adults radiated to their individual home ranges despite all herders' efforts. Obstructing machinery hampered browsing in a forest, and moose didn't look well-nourished. Attempt of so-called «inoculation of a gregarious instinct» failed, too; this idea belongs to Lysenko's followers' parascientific arcana. If a problem has no solution in today's science and technology, people who at least «do something» seem to rise to the occasion. To change heredity without any «chromosomes-ribosomes» and genetic engineering, they simply used 6 fences, a saddle horse, and, of course, a whip. While moose were crowding near a narrow gate, they were «inoculated» with a «gregarious instinct». Now I understand: following this theory, queuing for sausage should «inoculate» Soviet citizens with team spirit and collectivism. I am afraid, the people beyond the former «socialism camp» cannot understand what I am speaking about. If this idea were not put forth by Dr Sci, Professor, etc. I'd never mention it on this site. Moose appear to be smarter than cattle-breeding academicians, they still didn't change their inheritance and don't want to keep in herds controlled by herdsmen, and «specially trained dogs» hardly could help. In 1980-s dog trainers began to use radio controlled electric shockers. At the end of 1970-s I occasionally met a Russian engineer who was ambitious to make a satellite system to «control the behavior of moose herds» and asked the moose farm director for funding (about $million). He demonstrated a dog equipped with a set of shockers to journalists. All her movements were controlled through a console. 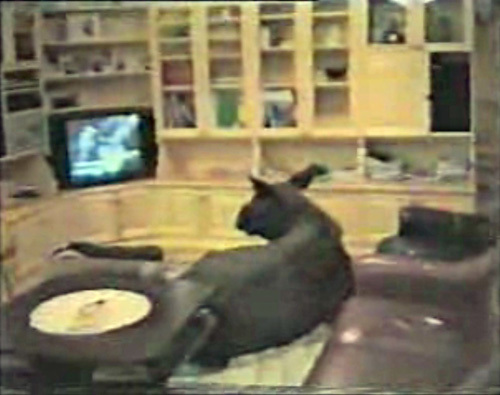 A dog was moving like a radio-controlled model-tank. As a journalist wrote, the dog looked slavelike and miserable. I think the system was a prototype of a future military purpose system. Perhaps, soon we all will be controlled by means of implanted chips and commander satellites?... The farm director couldn't find a $million, he found 10 thousand roubles, and ordered a «moose controller», say, «radio-whip» in our institute. I made a moose collar with a hidden switch and «proved» that moose don't feel pain from an electric discharge which is very painful for a human. The director didn't venture to test the collar by himself; he put it on one of the human «volunteers» who got a good electric shock. Fortunately, soon the «ineffective» collar was forgotten. Almost at the same days I tested another «stimulation» system for moose cows which was designed only to hurry them to come for milking without saying them where to find food. It had a radio-controlled siren wailing from the moose collar when I pressed a button on a console. I can't say it was effective, because another, a very simple system is used on the farm. In 1979 I mounted a loudspeaker on the milking house roof, and an amplifier with microphone and tape recorder inside the house. I recorded sounds of a trumpet («pioneer horn») and voice calls of every milkmaid ever worked on the farm. Some older cows prefer to respond only to their first dairywomen voices. If the weather is calm, the calls can be heard on Volga river bank as far as 8 km away from the farm. Now there's no need to use loudspeaker calls every day because moose cows come to milking more or less at scheduled time using their biological clock. I think that no kind of controlled browsing is good for moose. Productivity of forest pastures is much lower than steppes and grass fields used by other domestic animals. Perhaps, this is the reason why moose is a solitary species. A herd of moose would exhaust pastures too fast. Exterior appearance of moose calves who were driven across forests by 2 herdsmen (one was leading, another hurried them with a rod), was worse than that of free-ranging calves recently. No herdsman can find plants necessary for moose better than they themselves. Only sometimes a human can give calves a cue taking them to a pasture abundant with willow herb, for instance. Nevertheless, some moose breeders come back to «controlled grazing» though in 1973 Michail Kozhukhov, the second director of the Pechora moose farm doubted (2) the necessity of «inoculation of herd instinct» just for this reason (though he believed, this can be done). I suspect I know the reason. They regard the «meat direction» as main in an animal husbandry, thus are not sure that free moose will stay on a meat farm on their own accord. 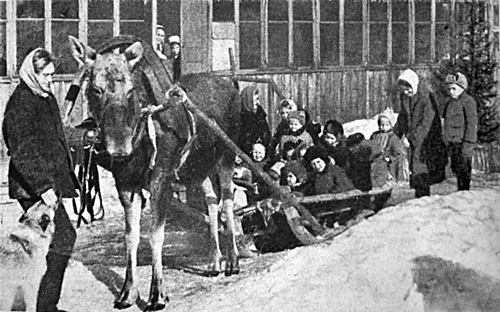 Stalling was not tested on the Kostroma moose farm at all. It was tested on Pechora farm, and in the end all the animals were released. «Stalling and enclosure management one must admit as inappropriate», concluded Eugene Knorre, the first director and establisher of the Pechora moose farm. With few exceptions, moose cannot survive in stables, small enclosures or zoo cages. Only several zoos on earth keep this species successfully, for example: Leningrad zoo, Anchorage zoo. 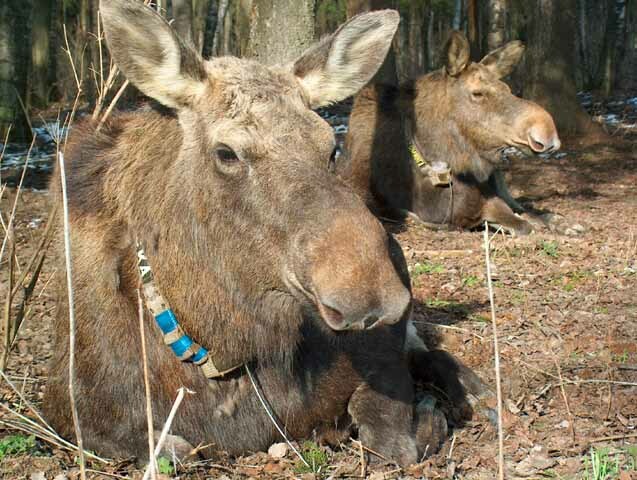 As a rule, captive moose suffer from the «wasting syndrome complex, WSC» (1), the number of deaths showed a peak at the age of 6–8 years – while on moose farms animals live up to 18-20 and give offspring up to 17 (4). Unfortunately, if a species has a short life span in a zoo, dying individuals are simply «replaced with new ones». «Moose are among the easiest cervids to tame and train but the most difficult to sustain in captivity» (5) though attempts to contrive a well-matching ration are continuing (6,7). These rations turn out to be very expensive, too, because of need in either separation of eatable twigs and bark from heartwood or large mass transportation: moose do not eat branches over 10 mm in diameter. «Mazuri moose maintenance» pellets containing aspen sawdust as a main component may support moose life in a zoo pen for long time if no grass (helminthes seminary) is present, but will a moose feel happy? Pellets are too expensive for Russian practice, but even more expensive should appear long fences around areas where moose can exist in spring, summer and autumn, without pasture degradation. Radio and GPS tracking of free moving Kostroma milch moose revealed (8) that they all use «only» 3000 ha for everyday browsing; I called this range «a central zone of summary home range of farm milk moose», (see 3 on the scheme below). Though the whole «summary home range of all farm milk-moose» is as large as 36000 ha (2 on the scheme below), they spend almost 99% of time inside the central, feeding zone. It is almost impossible and too expensive to build and support such an enormous enclosure of 3000 ha, and, as cows sometimes visit the peripheral part of their ranges, they may need something which they cannot find in the central zone. Evidently, it is necessary to guard the whole range from poachers and preserve moose food on its territory. Therefore, the domestic moose range must become a reserved (specially protected nature) area. It cannot be a nature reserve «zapovednik» because its rules inhibit any commercial activity. It can be a «hunting reserve» or reserved area «zakaznik» or National Park. If foraging conditions are like in Kostroma region, the full protected area must be at least 36000-40000 ha. Please pay attention to a remarkable coincidence between «summary home range of all farm milk-moose» and existing reserved territory (3 on the scheme above), which covers it almost completely (8). It was re-organized in 1999, but had almost the same borders since 1963. This is a very large territory to be protected because of a high poaching level in Russia, it needs high expenses; this increases prime cost of moose husbandry many times. Despite highly increased efforts, the farm misses 1-2 milch moose every year. Moreover, Kostroma city needs a territory to expand, and the regional administration decided to deprive the zakaznik of a strip between Volga and Kostroma-Krasnoye highway to build new cottage villages for rich citizens. As a «compensation», the administration added an equal territory eastwards from the farm. Maybe because the funding was discontinued, and the «milk-and-excursion» moose farming is successfully developing, the cattle-breeding scientists almost gave up efforts to make a «forest meat cow-horse» from moose by means of bloody «artificial selection» or torturous training either using radio-whips or without them. This is a paradox: if you take moose as is, he is a domestic animal. 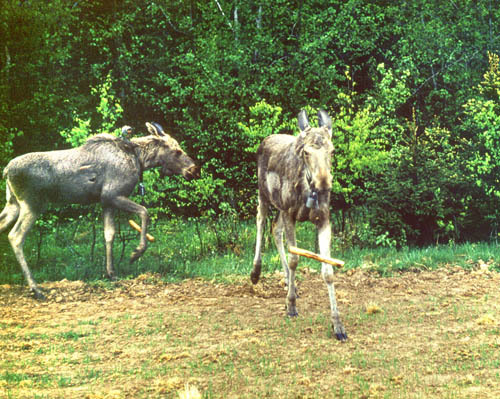 The Buzuluk moose husbandry and Pechora farm invented and developed a semi-free method of moose breeding and keeping, which, further improved, is used on the Kostroma moose farm. The only loss is the idea of profitable meat farming. Next pages will tell about up-to-date breeding and keeping methods. 8. Минаев А. Н. (2008). Оценка площади особо охраняемой природной территории, необходимой для создания лосефермы. «Лось в девственной и измененной человеком среде. Труды VI Международного симпозиума по лосю», Якутск, стр. 82-86. Russian, with English abstract.